Reviewing and Setting Property Details and Adding Post Orders so they are Visible for the Officers in the Field. In this article we will go over how to Add / Edit Post Orders and Setting the Property Details. Type in the Property Notes and/or Post orders. TIP: To save time, if you already have the Property Notes and/or Post orders in a word document, cut-n-paste them here! Any information entered here will be displayed in the notes section of the handheld. After making any changes to the post orders, click Save Property Details. Property Notes / Post Order Details: This field allows system users to enter any notes or post order information, which can be viewed by the field/handheld users when clicking on the “Note” icon in the handheld device.Note: It is recommended Notes/Post order information entered in this section be kept short and concise enabling the field/handheld user to easily view the information. Property Photo: The photo of a property ONLY appears for web users to see in Step 2 of the online reporting areas when reporting Security, Maintenance, and Parking Issues, Appealing, Ordering Parking Permits or paying fines online. Located to the left of the property photo, are boxes labeled: Lock Property, Maintenance Program, Security Program, Parking Program. The Lock Property option will allow Admin users to keep lower user types (supervisors, dispatch, and customers) from editing the property. 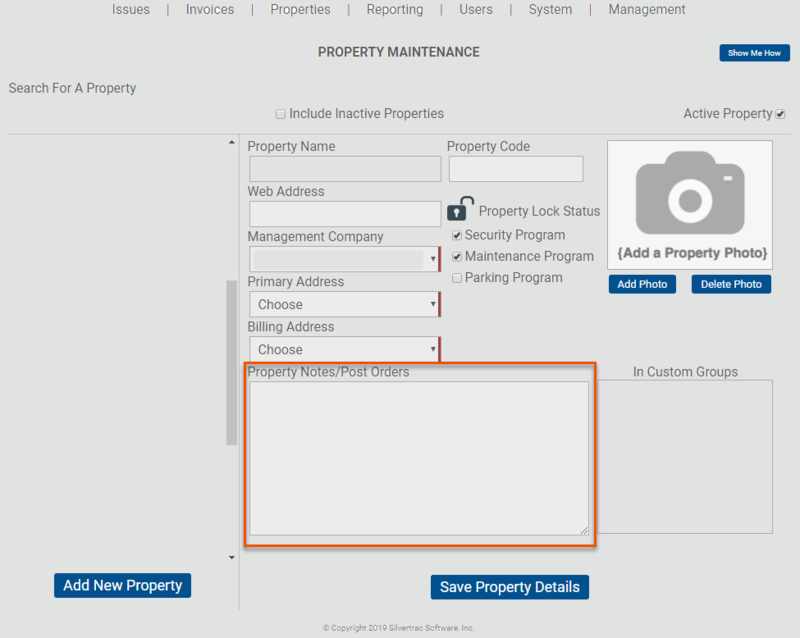 The Maintenance Program, Security Program, and Parking Program boxes allow you to control the individual programs that may be offered at specific properties you service by removing these options from the top menu bar on homepage screen for web users. In the top right hand corner there is a box labeled, Active Property. The Property Active box will turn off the property and place it in the inactive folder in the Edit Property list allowing it to be hidden from use or re-activated at anytime.